Pilate, the governor of the region announced Jesus was innocent of any crime and released Him, but the Jews would not be satisfied until He was crucified. Jesus was forced to carry His heavy wooden cross on His bloody back the long walk to the place He would be crucified. He did this for me, for you and for all who believe in Him. Middle school kids and teens need to know and understand what Jesus actually went through for them so they will have a greater reason to commit to living their lives for Jesus all their lives. It’s like soldiers going into war. When they understand why this was necessary, the stronger their commitment will be for the fight ahead of them. You are developing soldiers starting with teaching your little warriors how to obey you. Being characterized by obedience sets them apart from most kids even in the church. As your kids grow, they will become soldiers who will “fight the good fight for the faith” as Paul told his young prodigy Asha in I Timothy 6:12 to do. Easter is the greatest time of celebration for Christians, as it rejoices in the event that cemented our faith. It is a great time to remind your kids what Christ did for them, and to challenge them to live their life for Christ. 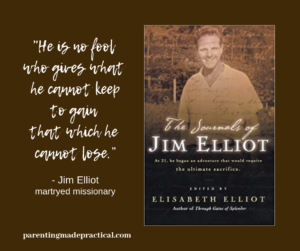 Jim Elliot, Pete Fleming, Nate Saint, Ed McCully, Roger Youderian and their families went to the jungles of Ecuador in 1956 to share the Gospel story of Jesus Christ with people who had never heard of Him. The Auca tribe was known to be violent but they went because God called them to. On one of their trips, landing their plane near the village, all 5 men were violently killed. They were all in their late twenties and early thirties. Can you imagine being one of those wives or children, knowing God wanted you to forgive those warriors? That is what forgiveness is – being willing to forgive those who hurt you the most. Nate Saint’s sister, Rachel and Jim Elliot’s wife, Elisabeth went back to that jungle and worked amongst the very tribe that took their husband and brothers lives, showing them the true power of forgiveness so they could understand why Jesus would die for them. Pete Fleming’s wife, Olive, went back to the jungle 33 years after the massacre to find out if any good came from their sacrifice. She found that because of that fateful day, a whole people group came to faith in Jesus Christ because of 5 men who said “Yes” to God. What are your kids chasing after? How much have they taken hold of to follow Jesus Christ? Have they truly committed their lives to following Jesus or have they only learned to believe because you believe? Are they confident in the facts of their faith? Can they defend their faith? Do they truly understand the power of forgiveness? The death of these 5 men was reported worldwide. They set out to share the gospel of Jesus Christ and they ended up proclaiming the gospel to the whole world. I would recommend a family movie night for older elementary and teens to watch. It’s on Netflix titled “The Case for Christ” It’s a true life story of a man who tried to prove Christ did not rise from the grave so he could disprove his wife’s faith. They show his pursuit of the facts (where your kids will learn the facts too) and ultimately he comes to the conclusion like the soldier guarding Jesus crucifixion on the cross who said, “Truly this is the son of God.” This family night will be a helpful confidence booster to your kids’ faith and hopefully challenge some of them to increase it in their hearts. It truly saddens our hearts when we read statistics of over 86% of kids that grow up in Christian homes and go to church regularly end up walking away from their faith in the teen years. We write this to challenge and encourage Christian parents to not only help your kids develop sports and musical skills, but ultimately help them want to know Christ and pursue Him with their lives. It took 24 men working 24 straight hours with Thomas Edison to create one of his crazy ideas we are grateful to have today, the lightbulb. When Edison created his first lightbulb, he gave it to a young helper who nervously carried it up some stairs to be lit. Each step he took he cautiously watched his hands, frightened of dropping this delicate new creation. As he reached the top of the stairs he dropped the bulb. OH NO! As a parent, you have likely entrusted a special treasure to a child who wasn’t as careful as he could have been and he broke your prized possession. It took all 24 men another 24 hours to make another bulb. With the new bulb finished, Thomas Edison did the unthinkable; he gave it to the young lad again to carry it up the stairs. Most of us would not trust it to this lad again, but Thomas Edison, who had failed over 1000 times at successfully creating a lightbulb, knew what failure was, and in wanting to teach his young prodigy a confidence lesson, he forgave him for breaking the first bulb and turned and asked him to carry this one up the stairs. He did so successfully. Forgiveness is a difficult thing to do! Jesus was in a similar situation in John 13, only he knew Judas would betray him, yet when Judas came through the door, Jesus knelt to wash his feet. How trusting and kind are your kids with someone that has hurt them after that person has genuinely apologized? How trusting and kind are you with your kids after they have failed you? Every child is going to disappoint and embarrass their parent at one time or another. How do you respond to them when they embarrass you and you know they know better? When they disappoint you at home? In public? These are key moments for the development of your child’s confidence. When you respond positively you are giving them hope for the future which strengthens their emotional and spiritual core. Personally I think the disciples missed the point of what Jesus was saying as they started asking about where Jesus was going. He was telling them to love each in a way their peers would never understand. He gave them an example of this when He washed Judas’ feet even though He knew Judas would betray Him. Washing feet was a servant’s job. There was no such thing as paved roads and everyone wore sandals. Their feet were filthy. Yet Jesus knelt at the feet of this man, showing true power lies in being humble. This a powerful teaching to share with your kids, that you love them and you can forgive and trust them over and over and over again. Yes, we believe trust must be earned, and I am sure Thomas Edison’s helper had that kind of attitude after he dropped the first bulb or else Edison would not have given him a second chance. When your kids apologize after choosing to do something wrong, can you see in them a remorseful heart? How do you know if their heart is remorseful? They will truly try to do what they can to restore the relationship and make right their wrong with a good attitude. Jesus realized He had lost one disciple but He still had eleven more! Mom and Dad, your kids may fail you, but there were probably obedient eleven times to that one. Encourage them with that and then give them the challenge like Jesus gave His disciples, to try again. I think Jesus was challenging his disciples to still go and love Judas when they saw him, and to love each other when they failed. Love siblings, friends and other adults who fail or disappoint them? Are they quick to forgive them and look past their faults even when they have been hurt by them? Do your kids truly know how to love others who don’t deserve it so that people will know they are a follower of Christ? 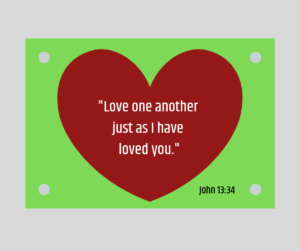 Are your kids pursuing following Christ by following Jesus’ command to “love each other” by showing others they are important to them? Every parent celebrates “sphincter day”! OK, it may not be a national holiday, but the day your child learns to use their sphincter muscle to go potty in the toilet on their own initiative is a day of triumph for parent and child. It’s a day of celebration because you get to save money on diapers and because it is a huge sign of maturity for a toddler. Every parent wants their kids to mature as they grow up. But what does “grow up” look like for your child? To be mature is to be fully developed, complete, and “grown up” for a given age. It is a process that requires consistent parental training, but even the best training won’t mature a child past what their age can process and handle. While every parent wants their child to grow up and be mature, living through it is not always easy. Becoming mature is a constantly moving, changing, developing and evolving process which includes them growing and maturing physically. Some kids mature quicker and some are more delayed. Letting a child scamper up a climbing wall or swing between the monkey bars when they say they can do it can be a hair-raising call for parents, because they fear the child might fall and get hurt. It can also be easier to hold a child back from maturing because it’s simply too much work for the parent to guide and even push their child where they need to grow. Sometimes it’s just easier to not have to push and fight a child who doesn’t want to “grow up” in a certain area. One area Christian parents often overlook helping their kids mature in is their spiritual growth. I (Joey) grew up going to an Awana program at our church. I received the Timothy award one year for memorizing the most verses and growing in my faith. While memorizing the verses was the easy part, I don’t remember my parents or anyone else asking me what the words or terms I was memorizing meant. In reality, they were just that, words I memorized. Our grandchildren go to an Awana program and we facetime them every Wednesday afternoon to work on the verses they are memorizing and talk with them about what the verses mean. You take your kids to church but when do you ask them what they learned and how they will apply it? 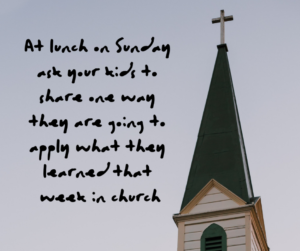 Our kids knew this question would be part of our Sunday lunch table discussion so they paid attention to their teachers and the sermon and were prepared. You can help them memorize books of the Bible, but when do they learn what is in that book and why God chose to include it in the Bible? It wasn’t until I was sitting in Old Testament survey class in the Bible College I attended that I actually felt like I understood the Bible. Oh, how I wish I had greater understanding before that. Oftentimes Sunday school, Bible studies and youth groups are good at reminding kids how God wants them to live, yet they are often greater at keeping the kids entertained to keep them happy. Oswald Chambers, the author of “My Upmost for His Highest” encourages and challenges Christians to be more concerned with their holiness than their happiness. Are you more concerned with your children’s holiness than their happiness? How Are You Helping Your Kids Grow Spiritually? Do you help them memorize Bible verses each week? Do you help them understand what the meaning of Bible stories are? Do you ask them what they are learning in church, Sunday school, Bible studies or their own personal study of the Bible? Asking them can be one thing, but helping them understand is every parent’s responsibility. Next week we will give you 12 ways to help you evaluate where your child needs to mature spiritually. Joey and I will be celebrating 41 years of marriage this week. In the early years of our marriage Joey was a youth pastor. We went to the high school’s sports and music events, both of us led Bible Study groups and planned youth outreach activities. My involvement in all of this came to a screeching halt when we had our first child. I became a stay-at-home mom while Joey still attended all these activities. When he got home he wanted to spend time with his son. Our marriage was paying a price, but our attention was focused on other things. Things came to a head when Michael was 6 months old. Early on in our marriage before our 1st anniversary, we decided we would go away for a weekend every year on our anniversary. After we had Michael, Joey started talking about where we would go for our anniversary and I told him if we went anywhere Michael would go with us. Joey had other ideas. We drove about 3 hours north to where my father lived and we left Michael with him to go out to dinner. Then we drove to a nice hotel on the beach. I had been kidnapped by my husband! He told me we were going to have a weekend together alone. We talked a lot and made some good decisions about spending more time together. We had never heard of child-centered parenting but we had been living it in spades. Why should your marriage relationship be the most important relationship in the family? When you became one in Christ on your wedding day, you made a commitment to love, honor and cherish your spouse for the rest of your life. Your vows didn’t say “except for the years our kids are growing up.” It said for the rest of your life. How are you going to give time to loving, honoring and cherishing your spouse when your kids are more important to you than he/she is? Here are three ways to be intentional about your marriage. Love – The definition of love says it is a close friendship with affection and physical attraction. To love your spouse, spend time with him/her as friends. I (Carla) have been to and watched on TV more Los Angeles Dodger baseball games than most men do. Joey has certainly been to more ice skating shows than most men would stomach. Show interest in what each other likes to do. Hold hands. Look at each other with a twinkle in your eye. Honor – To honor someone is to hold them in high esteem and respect. It means you don’t treat the other in rude and disrespectful ways and you view the opinions, wishes and values of your spouse as you would your own. Cherish – To cherish someone is to treasure them. How do you treasure your spouse? We take good care of the things that are important to us, giving them special care. When was the last time you gave your spouse “special care”? Spend your marriage loving, honoring and cherishing each other and you will be leaving a legacy for your children that they will treasure and your empty nest years will be golden. If you don’t set this example for your kids, where will they learn it?